Every day on the Nigerian internet, there are people who keep our eyes glued to our phone screens as we read their rants, opinions, perspectives on political and social matters, etc. Sometimes, they are just downright ridiculous. We make it our job to take down the names of these noisemakers. It was all about Wizkid on Nigerian Twitter today because last night he sold out the Royal Albert Hall in London and didn’t fail to deliver performance wise. Fans were so in thrall of Starboy’s performance, they got heady and proclaimed him a legend far beyond Fela’s star. Are you that young not to know Fela? Did you not read about him? Was his story not narrated to you? It's not too late. Google "Fela". This section of TwitterNG was just mad someone had the audacity to compare the two, birds NOT of the same feather and all. They started out pleading and ended with some severe scolding- which Twitter delightfully retweeted 1000 times. There is nothing wrong with celebrating an artiste without trying to drag another one down or kill achievements with comparison. Peace. The good Doctor wasted no time throwing shade, since that was Dolapo’s intent anyway. In order to level the playing field, Olu dragged Wande Coal into the debate. Interestingly, Wizkid gave the floor to Wande Coal during his show yesterday. As far as Olu is concerned, the two are mates. If not that Wande Coal is unserious & chooses food & awoof over his music career. You should have been comparing Wizkid to Wande, not Fela. Now we get into the meat of the matter. Ekere lists the artists Wizkid has to surpass first before comparisons with Fela can begin. Besides mastering 6 instruments, Fela birthed a genre and sound that was all his. Not to mention his social activism and how that impacted..
..his generation and more to come. Wizkid is a talented artiste, no doubt, but not comparable to Fela’s stellar career spanning 30+ years. My dear people are remaking Fela's sounds how many years after his death. His music is part of some syllabus in music school. Fela was way more than a musician. And in case this slipped by yo the first time, read it slowly and take it all in. Wizkid and Fela. Blasphemy. Sacrilege. Oro buruku l'enu eiye. Obsessed by Western rating. When scandal hits all that rating will be floored. 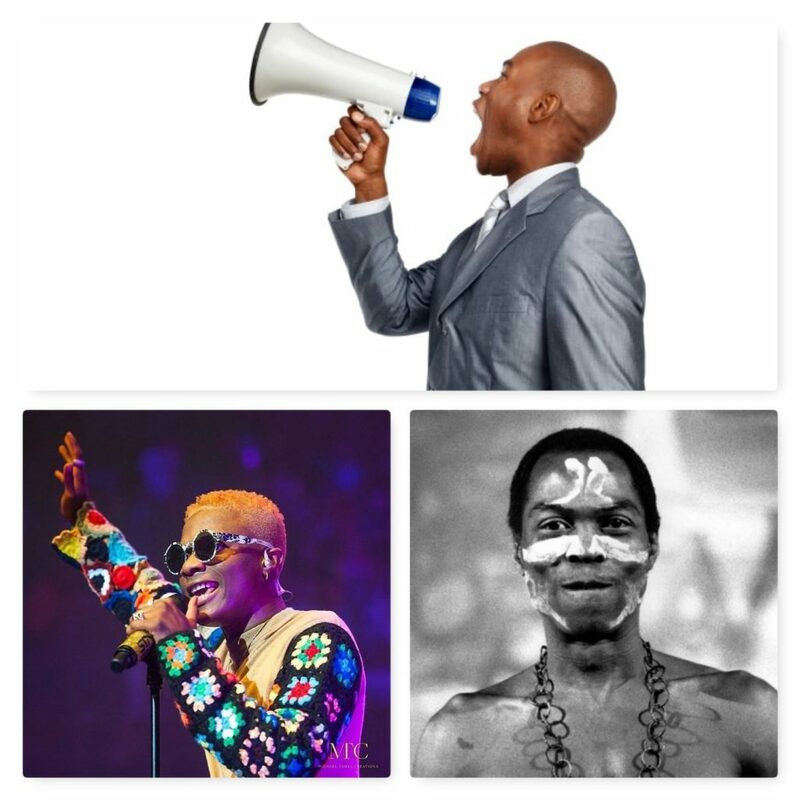 Wizkid shall not equal Fela Kuti's legacy. Anybody who says Wizkid is greater than Fela is seeking for attention. Don't give it to them. Even Wizkid knows that Fela is his great grandfather when it comes to musical greatness. Joachim MacEbong says it shows how young Nigerians onTwitterNG are. This debate (that is even if it is worth that name) over Fela's place in history is a reflection of the average age of Nigerian Twitter.